I enjoy challenging kids to respond to prompts and love to celebrate their creativity with them. So today I have a new prompt. 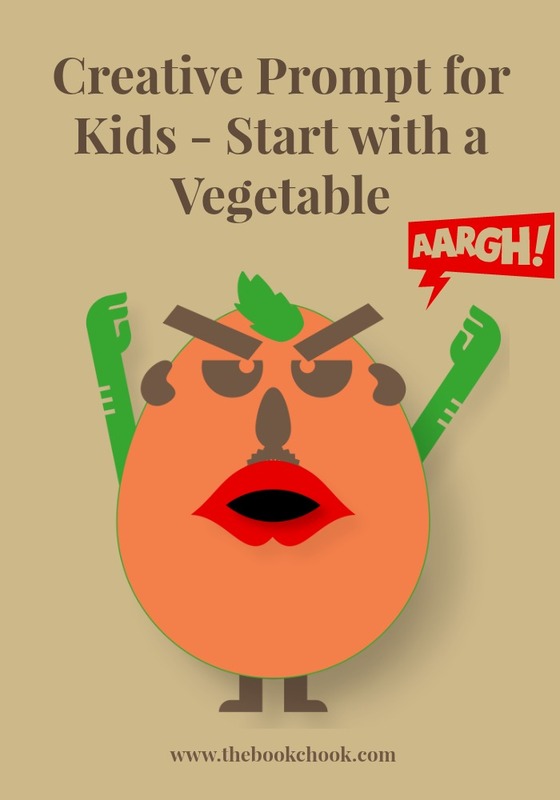 It asks kids to start with the concept of a vegetable or with a real vegetable, and use this as the spark for any kind of creativity. Remember, the important thing is that kids create SOMETHING, so deviating from my suggestions is definitely to be encouraged. You’ll find all my creative prompts to date in the list far below. * Use bits and pieces to transform a vegetable into something else - a potato could become an alien creature, broccoli might be someone having a bad hair day. You might like to limit yourself to a set number of extras eg only raw spaghetti and blu-tak. Or you can just let yourself go! * Here are some story titles you might develop: Beware the Black Potato, Look out Brussel Sprout, Peter Parsnip Superhero, A Day in the Life of a Pumpkin. Or invent some of your own! * What’s the most delicious menu you can create, using only vegetables? * Learn how to make a carrot cake and bring a taste to school for your class. * Create an advertisement for your transformed vegetable, persuading people to buy it. * Choose any vegetable to base a cartoon character on. Create some adventures for your vegetable. * Write a poem about a purple pea. * Create a house for your transformed vegetable to live in. * Retell the story of the three little pigs using your vegetable of choice. What villain will your story have? * Create a short video starring your transformed vegetable and give him/her some vegetable friends. * What if someone wished very hard for a baby and they got one, but it was a vegetable. How would they dress it and look after it? What might happen? Make a story about that baby. * Have a game of Hot Potato with your friends/class. One person tosses a ball or beanbag to their right around a circle until the music stops, when the person holding the ball becomes the hot potato and is out. Invent another game with a vegetable name and teach your friends the rules so everyone can play. * Choose names for a gang of vegetables that are causing trouble in the local community. What mischief do they get up to? Who or what solves the problem? * If there were a battle between a cauliflower and a carrot, who would win? Create a cartoon about it. * Join some friends to collect and illustrates some jokes about vegetables. * Find a version of The Enormous Turnip, a Russian folk tale. Re-tell this story the way you choose. * Design a new vegetable, one that children will love to eat. Draw and label your design. * Make teeny tiny vegetables out of any kind of material. * Transform yourself into a vegetable. Invent a language for yourself. Take some vegetable selfies. * Learn how to make vegetable soup. * Plant some vegetable seeds and grow your own vegetables. * Invent a car for a vegetable to ride in. * Imagine if Spudzilla escaped from The Institute for Weird Experiments on Vegetables. Where might it go? What would it do? How would it sound? What might happen next?